We can help you transform your front door to make a statement and increase your home’s curb appeal. 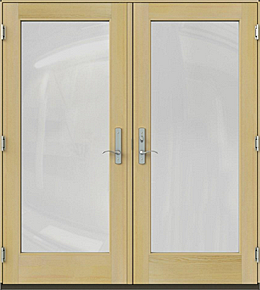 Our exterior door options can include decorative glass, handles, knockers and more. You’ll find the architectural style you want to achieve. Simply Yours Windows Doors has hundreds of doors for you to choose from. We have exterior doors available in wood, fibreglass (can include the look of real wood) and steel doors. We also supply and install patio and sliding glass doors. Simply Yours Windows Doors has a number of suppliers who we work with and there are just too many to include on our door pages. We have an incredible selection to choose from and we would be happy to provide a free consultation to find the exterior doors you're looking for on your home. Door Configurations - choices include single or double doors which allow for more opening space. You can also add sidelights (windows) to give the illusion of a larger entry and for more natural light for the entryway. 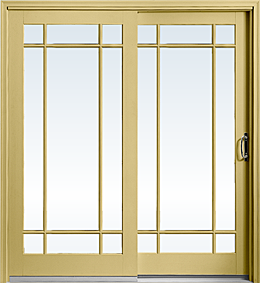 Door Swing - doors are available with inswing and outswing models. Exterior doors are able to swing toward the home or away from it. Door Panels - you can select a number of panels for your exterior door and even choose glass as the panel style which give a number of choices for style and appearance. Glass Options - the glass you choose for your exterior door can feature performance values like impact-resistance and Low-E glass to improve energy efficiency. Decorative and textured glass or blinds between the glass will address functionality and privacy. You can create the exterior door to give your home the look you desire. Call us for assistance or advice and we’ll help you find the perfect door. Choose the product type you want. Choices include wood, fibreglass or steel. Wood can be stained or painted to your colour preference. Fibreglass can be painted any number of colours or can come in real-wood grain look. Steel can also be painted in a colour you want. You can choose between any number of configurations for your entry door, including some examples seen above. The possibilities are endless as you can create the entrance to your exact preference. Choose the shape of the glass you would like on the entry door. There are a number of styles of shapes to choose from including more than the examples above. Glass options can include impact-resistant and Low-E glass. Select the door handle and door swing preferences. Entry doors are able to accommodate the layout of your home and there is a variety of single and double door swing configurations. Call us to help you decide which doors fit your taste and budget.